We left on October 2nd, a Saturday at 2:36 p.m. We flew using my TWA frequent flyer miles and thus went from Detroit Metro to St. Louis and on to London. 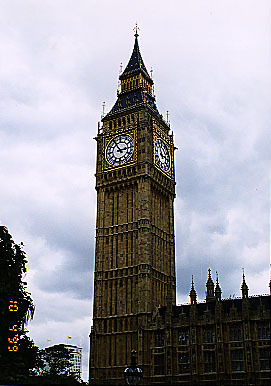 It took about 2 hours to get to St Louis, we then had a 7:20 flight to London. They were offering a free international flight to use within one year if you would go a day later, but due to only having a week on our whirlwind tour we passed on the offer. We arrived in London at 9 a.m. (London is five hours ahead of Detroit, six from St. Louis) it was a 8 hour flight from St. Louis. Once we arrived at London Gatwich Airport we were suppose to be met by Hotelink at the gate, somehow they missed us and we went downstairs waiting to get the shuttle when it showed up. When it showed up we were told we had to get on a list upstairs, which as you can guess didn't thrill us after traveling all night so we said forget it and caught a train (10 pound, 20 pence, the pound was worth $1.65 US) each and then the tube (the underground subway) to the Bayswater area where our hotel was (the Bayswater Inn). Our room was OK, not that exciting by US standards. We had two single beds and the bathroom needed some updating. 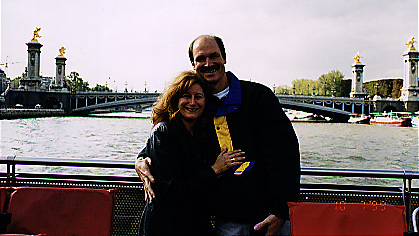 Our first day was a Sunday (10/3/99), and after touring the area a little (check in time was 3:00) we took a nap from 3:30 until 8:30. When we got up we went to a pub for a drink (I had a directors beer, it was good), we were suprised to find out bars close at 10:00 on Sundays and 11:00 on weekdays. Restaurants and discotecs can serve later. On Monday we got up and had breakfast at the hotel, it included breads and jams and coffee, all else was extra. We then walked to Kensington Gardens. 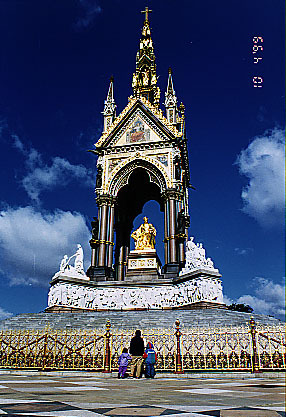 We saw a statue of Peter Pan, the King Alberts Memorial and Kensington Palace. 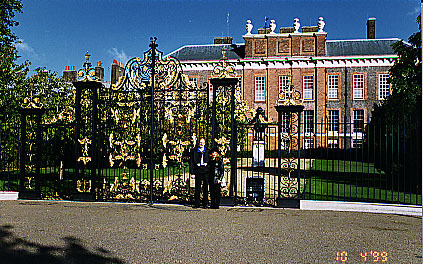 At 10:00 we took a tour of Kensington Palace for 19 pounds for both of us. On the tour was a room with some of Diana's Dresses. After the tour we walked to the Thistle Marble Arch Hotel to catch a tour. Our second bad luck of the trip as the bus driver didn't come in and somehow missed picking us up. Lynn was ready to give up on planning and asked me what I wanted to do and I suggested the double decker bus tours. So, we bought two tickets that were good for 24 hours and boarded a bus. 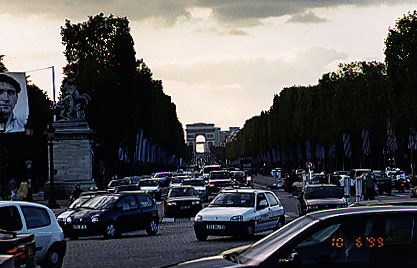 The way it works is, the bus goes on a circular route past many sightseeing attractions and you get off where ever you want to spend some time and get back on another bus that comes at 10 - 15 minute intervals. We randomly picked The Original Tour, but there were two other bus tours that seemed to do pretty much the same thing. Check out this babe I found in front to the Tower Bridge! 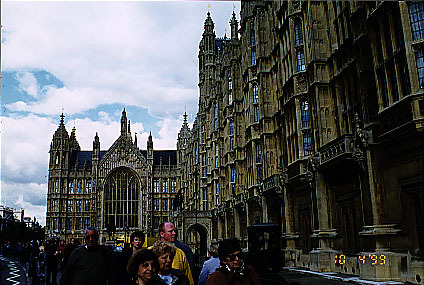 We got off at Big Ben and the House of Parliament on one stop. 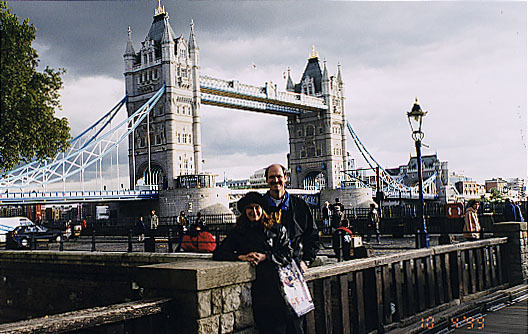 Another stop we made was the Tower of London, we paid 10.50 pounds each to get in and look around. You could also see the Tower Bridge we had just crossed getting there. 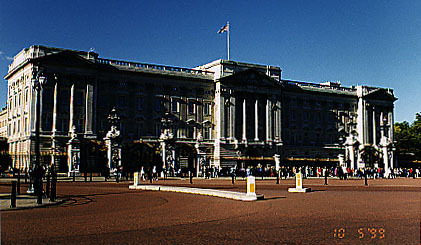 Our third stop was by Buckingham Palace and we went to T.J McDuffys Bag O Nails for a beer until Bumbles was open for dinner (30 pounds total). We then waited for a bus that was suppose to run until 8:00 but really stopped at 7:00 so we caught the tube (subway) back for 1.40 pounds each. Tuesday we got up early (7:30) and thought we heard lightning, so I looked out our window and saw dark smoke rising to the South. About 15 minutes later we found out it was the train wreck at Pennington Station. There were many fatalitys and injurys. This was the above ground trains we had taken from the airport. 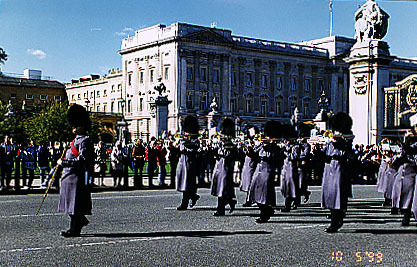 We decided to buy a day pass on the tube for 3.80 pounds each and took the tube to Buckingham Palace to watch the changing of the guard. 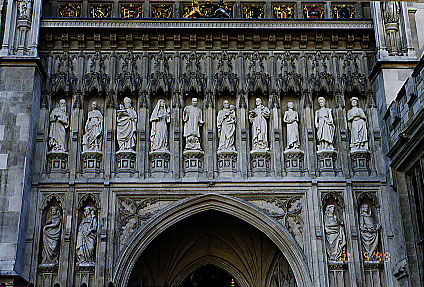 On the way we went to Westminster Abby. We watched the changing until about 12:30 then went for lunch (25 pounds) at Marche, Movenpick. 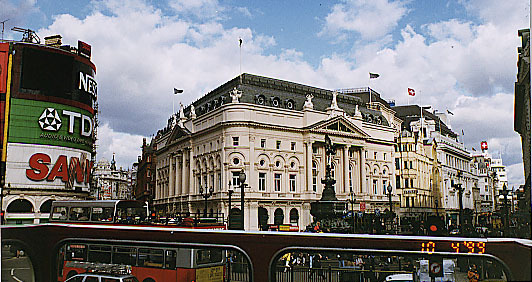 After lunch we walked to Piccadilly Square and took the tube back to our hotel to get ready for theater. We went out to see Wistle in the Wind by Andrew Lloyd Webber and then back to pack for Paris. 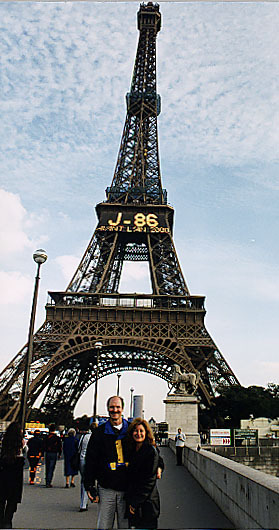 Wednesday 10/6/99 We took the Eurostar to Paris. 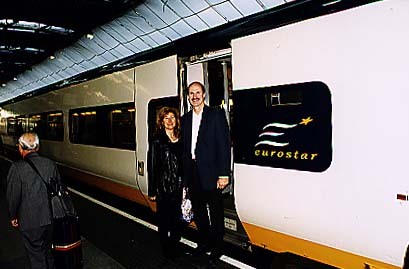 The train ride took 3 hours with 20 minutes being under the English Channel. The top speed reached was 300 kilometers per hour or 186 miles per hour. 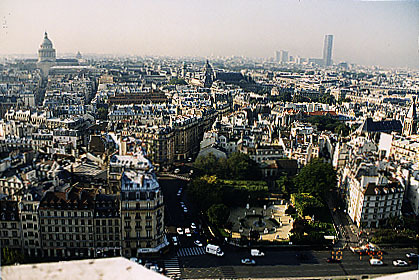 Paris is one hour behind London, and we arrived at 12:33. We then bought tickets on the Metro (40 francs) to get to our hotel (two transfers). 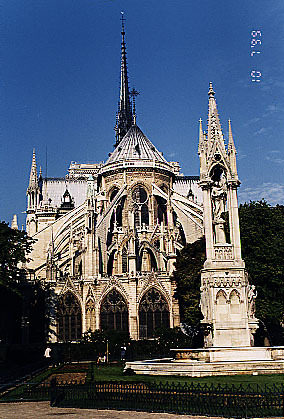 We ended up about three blocks from Notre-Dame at our hotel teh Abbatial Saint-Germain. The room was very nice, just a little small. 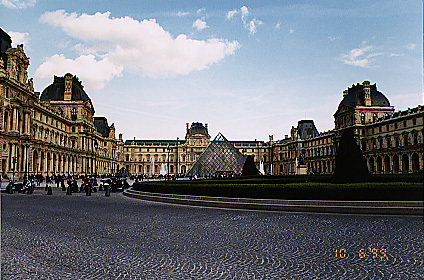 We checked in at 1:30 then went on foot by Notre-Dame, the Louvre (awesume building and sculptures). 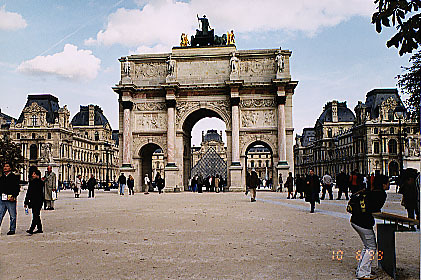 We then walked all the way to Obelisque (given to France from Egypt) then back by way of a bar to rest before dinner. For dinner we went to Cote Seine at 45 qual des Grands-Augustins (446 francs, about $75) for dinner for two, with a bottle of wine, apetizers, dinner, dessert and coffee. The food was good and we met a nice couple from the Carolinas. Communicating has been a little slow but a lot of the people in Paris speak a little English and a lot of restaurants have menus with an English section. After dinner we walked back to the hotel along the Seine river. Thursday we went for breakfast at the hotel, it was breads, jams, coffee and juice like London, but it also had cereals and croisants. 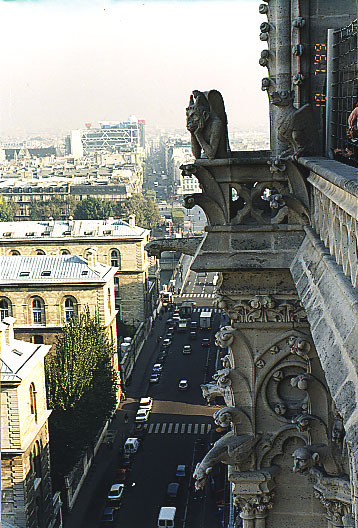 We then walked to Notre-Dame and paid 35 francs each to climb to the top and take pictures of the building and city. Then on with our tour we stopped at Bistro Romaine (10 Rue Coquilliere) for a sit down lunch and we had their specials (pick two items on the menu). I had a salad and salmon lasagna, and Lynn had a fish cake with basmonte rice and a wine, both were great. We then walked to meet our City Rama double decker bus tour. The tour was in English and Italian by one person and would have been better if it was totally english (I think she wouldn't have rushed as much). 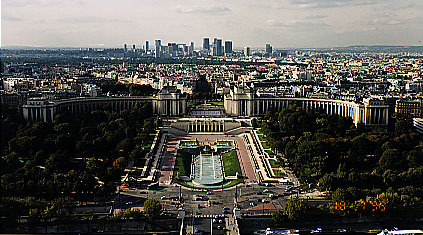 They did not follow the path shown in the brochure but did go past the Arc de Triomphe, had a hour boat tour on the Seine, and then got us to the second level on the Eiffel Tower. From there the tour went back to our pickup point, so we decided to walk back. On our way back we stopped for dinner at Vesuvio by the Arc (nothing to write home about). 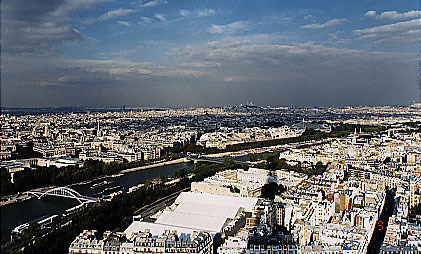 We then paid 40 franc each to go to the top of the Arc at night and walked back via the park with sculptures in it, the Louvre and along the Seine back to our hotel. 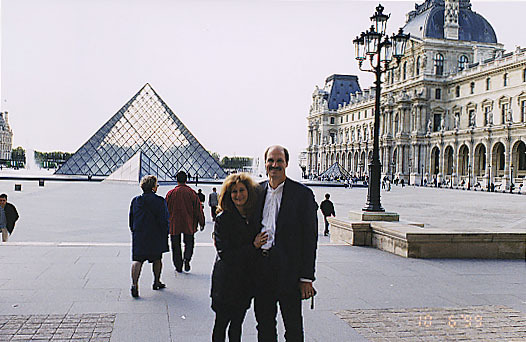 Friday 10/8/99 we toured our neighborhood a little, checked out the Sorbonne, the oldest University in Europe. Stopped for lunch at Restaurant Vartan (a good greek/middle eastern restaurant on St. Germaine by our hotel). After lunch we caught the Metro to the Gard du Nord station to catch the Eurostar back to London. Once back, we checked back in at the Bayswater Inn, 8-16 Princes Square. This time we got room 52 and it had three beds (one of which was a double). It was nicer then our previous room 222. After settling in we decided to go on a Jack the Ripper tour at Tower Hill on the Circle line with Dave from Ripping Yarns. It was a interesting walk, with a stop at a pub along the way. It only cost 4.50 pounds per adult but I would not recommend it for children. We then went for dinner at Khan's (13-15 Westbourne Grove, in Bayswater), they had good Indian food. Saturday we slept in, then went off the Harrods by the Knightsbridge station. It was a interesting but pricey store, Lynn enjoyed looking around and we had lunch their. Interesting tidbit - if you want to use the bathrooms you need to have bought something worth 100 pounds , have a lunch receipt or pay 1 pound. Lynn said they were very fancy. We then went back to rest up until theatre. We went to Covent Garden to have dinner at the Taste of India (good food), and then went to see the Lion King, which was very fun. After theatre we went back to our hotel to pack up. Sunday we woke up early luckily, since we didn't get our wake-up call and caught the Hotel-link to the Gatwick airport. Again, we could have gotten a free airfare for giving up our seats, but wanted to get home and TWAs hub is in St. Louis which is not very convenient for us. So, were back and planning our next trip. . .